You’ve heard the saying “The early bird gets the worm!” Well, that definitely applies to Champions Spring Special! This deal lets you stay for a reduced price when the snow is gone, the sun is out, and the weather is warm … but it’s still Spring! It’s a great deal for a great time of year! A standard site is just $273.00+tax or a pull-through site for only $294.00+tax. Bring your camper in on April 5th and leave it on site until May 19th! Take a look at the Resort Map and find your preferred site! Call (608) 582-2995 to make your reservations today! Armed Forces Day is a day which is celebrated on the 3rd Saturday in May. The purpose of this holiday is to honor the men and women who served the armed forces of the United States which include: the Coast Guard, the Air Force, the Navy, the Army, and the Marine Corps, as well as members of the Department of Defense. 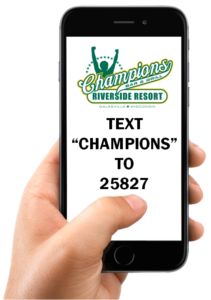 Champions Riverside Resort is offering FREE camping [May 17-19,2019]to all those who have served. Must show Military ID. To make a reservation call (608) 582-2995.